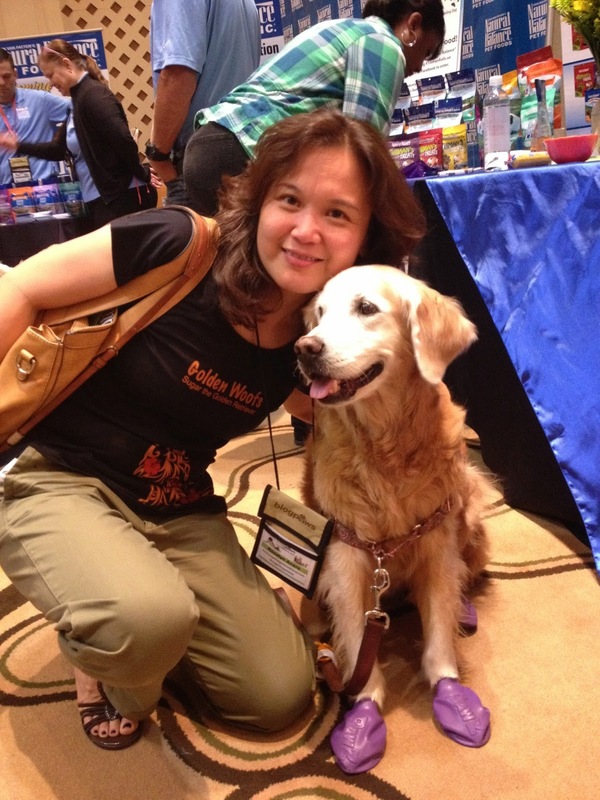 Parental Unit is a happy/sad combo this morning: So very happy that she was able to attend this year's fantastic BlogPaws Conference in Lake Las Vegas, Nevada, but sad that's it's over—bummer! She wishes she could go back and visit with more of her blogging buddies and the cool brands and animal organizations that participated in the conference. Yes, she heard inspiring keynotes and learned tons from the six individual workshops she attended (more detail on those in later posts), but what she enjoyed most was connecting in-person, or "nose-to-nose" as the BlogPaws folks say, with the amazing humans behind the blogs, and those who represented the animal organizations and brands at this year's conference. I'll start with what would have been my favorite spot—the dog park! Moving right along...the Friday morning opening keynote with (from L-R), Tom Collins, co-founder of BlogPaws and moderator, Dino Dogan of Triberr, and Chloe DiVita of BlogPaws. The super savvy business coach Lena West presented by video. 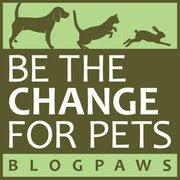 We're pleased to report that BlogPaws and many of it's speakers donated to local rescues and non-profit animal organizations. At breakfast the first morning, Parental Unit helped out at one of the several tables reserved just for the many "Newbies" at this year's conference. 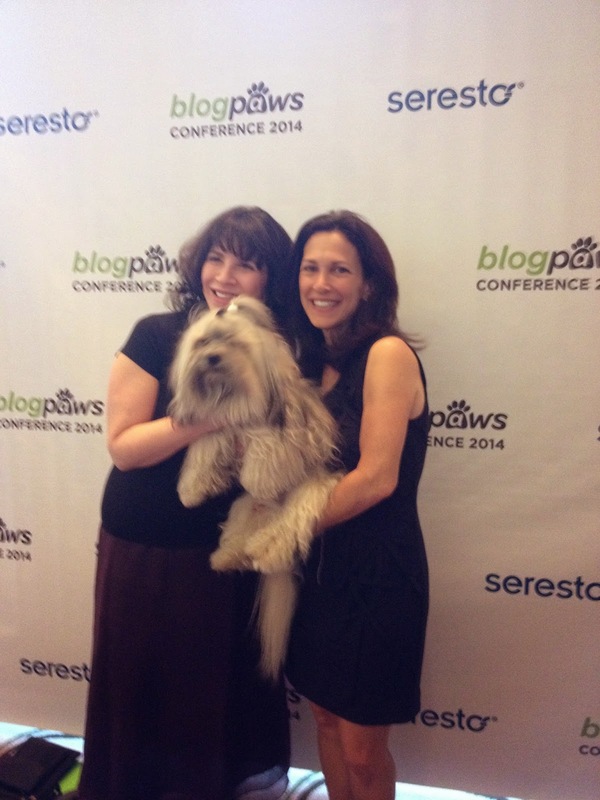 If there were any questions, BlogPaws veterans like Parental Unit, were ready with answers! 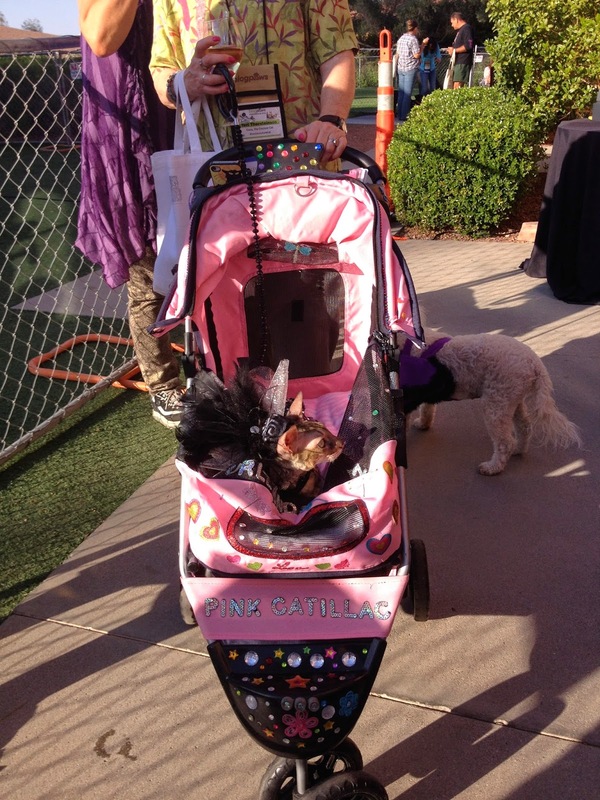 Here's one lucky kitty riding in her "Pink Catillac"! 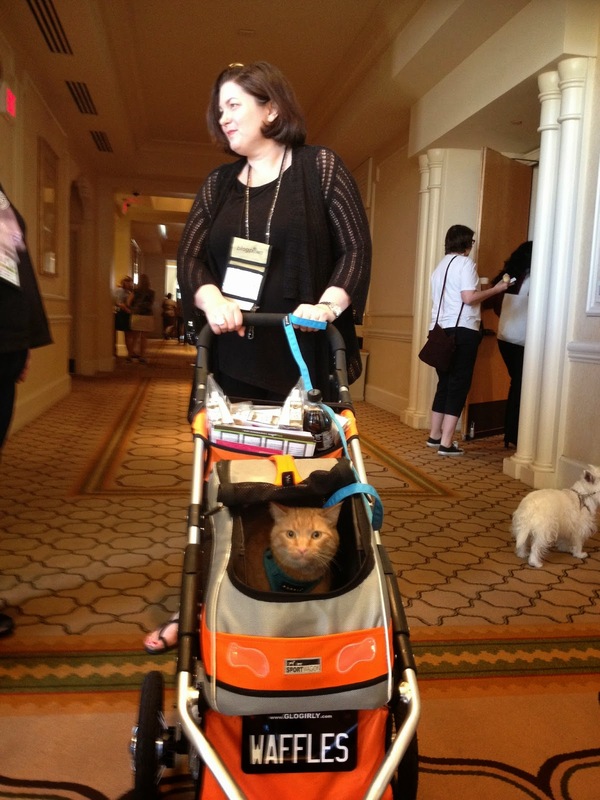 And speaking of cats, here's the rockstar of the cat world, GloGirly (she won two blog awards!) and her cat, Waffles. 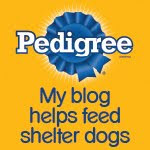 Another member of the broad pet blogging community, the world's largest rodent species. Parental Unit did not catch her name, but she drove the dogs wild! The trio of lovely gals representing PetSmart Charities—thank you for your good deed and donations on behalf of companion animals! The sign leading to the "Cat Style" Lounge—we'll do a separate post on this amazing curated space for cat products, and it's super cool curator and renowned "catification" lady, Kate Benjamin. Another one of our favorite pet food and all natural pet product brands, "I and love and you". Remember our recent review and giveaway? And here's a photo you'll all love—Parental Unit finally got to meet Sugar the Golden Retriever (Golden Woofs!) and her charming Parental Unit, Rosalyn! Here's the fantastic Olivia, the social media manager for the ASPCA, with whom Parental Unit has worked on many important ASPCA campaigns—so cool to finally meet Olivia in person! And last but certainly not least, here's Parental Unit on the red carpet with Diane and Rocco of "To Dog with Love". 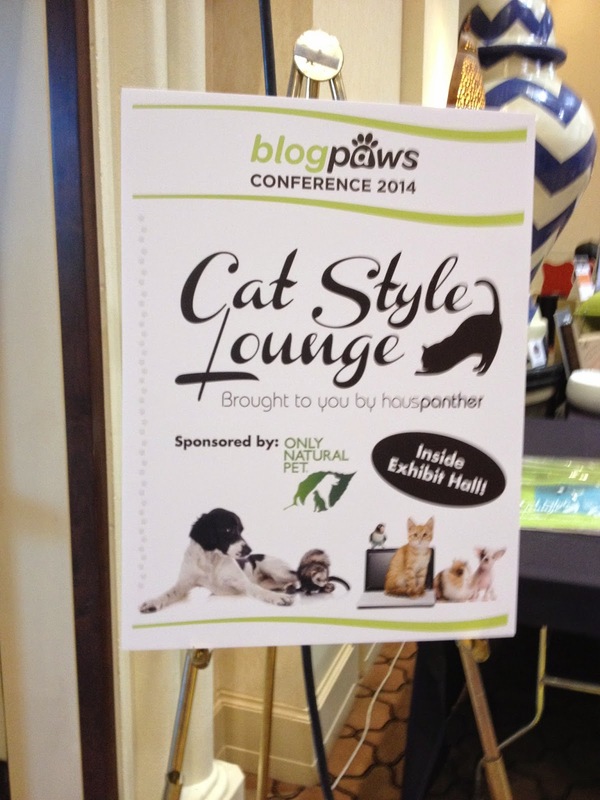 More from BlogPaws 2014 coming soon...but while you're in the BlogPaws mood, there's an early bird special going on right now until midnight tonight (May 12, 2014) to purchase tickets for the hootin' and a hollerin' BlogPaws 2015 Conference in Nashville! Ticket prices will never be this low, so we suggest you sign up now! Why not give Nashville a whirl, Bailey's Mom? 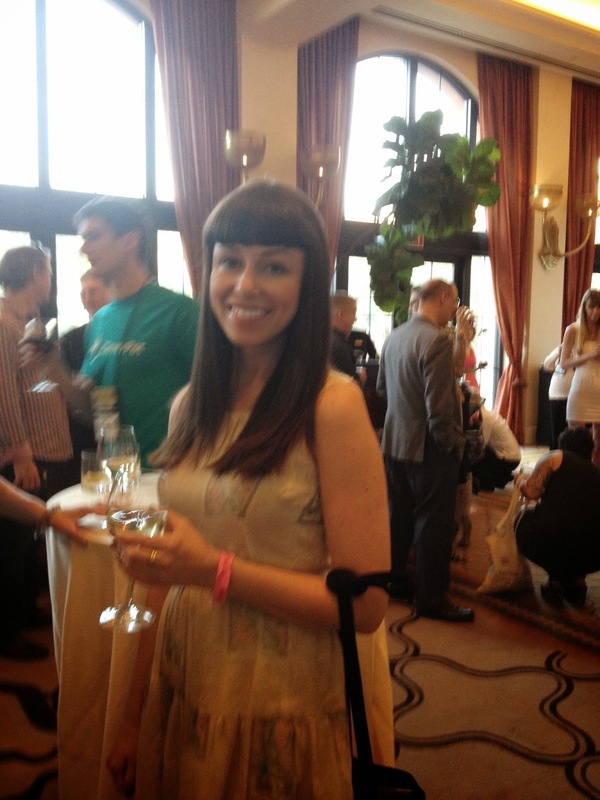 Glad you had such a fantastic time and so nice to meet some many people behind the blogs. Have a terrific Tuesday. OMD what a FINE TIME... We nearly FAINTED when we discovered that you got to meet Miss Rosalyn and Sweet SUGAR...IN THE FURS... Aren't they just BEAUTIFUL? SO glad that the PU had such a GRAND Experience. thanks for helping out with the Newbies Group, I was super proud that "my baby" grew to 10 tables this year!!! I went around to each and every table to say hi, somehow I must have missed you!